I remember in the late 70’s, a record collector friend acquired a roentgenizdat of the band “Faust”, who (I believe) was a Soviet prog-rock band. So, the roentgenizdat scene was still going on into the 70’s at least. There was an article in the Washington Post long ago, which is how I learned about x-ray film recordings in the USSR. Listening to such recordings was called, “listening to the bones.” Great phrase, isn’t it? My father used to have a pretty good collection of these. Among the records were: Beatles, Elvis, Thelonius Monk, John Coltrane, etc. The machine for making these recordings was originally designed for making “sound postcards” where you could record a voice message to your relatives on a flexible record; it was commonly found in photography salons. The same salons produced records on x-ray film after hours. Occasionally, you could buy a record on the “tolkuchka” market, play it, and after the first few bars the music would stop, and a voice said “You want rock-n-roll? F*ck you, anti-soviet slime” followed by a few minutes of elaborate and flowering russian cursing. These records were produced by the government in the attempt to flood the market with unplayable records and kill the demand. What killed the “record on the bones” was not government action, but availability of the reel-to-reel tape recorders. Very soon, people were trading tapes and making copies at home, without risk of going to the market. So, a vulnerable semi-centralized production system was replaced by a wholly de-centralized, free-for-all. The tape recorders became the BitTorrent of the 70s. I remember this was reported in one of the last few episodes of the famous BBC 2 documentary series The World at War – it was made in 1974, though re-aired in full more recently in Britain. Jeremy Isaacs being the main man behind it all. I am the editor on a doc all about the roots of Russian Rock and Roll. Much of it can be traced back to a few people, namely “Pete “Pits” Anderson, and Valery Saifudinov, two Latvian teenagers who started the first Russian Rock band. Also of importance was a Russian bootlegger by the name of Juris Lapinskis. I want… no… I NEED one of these!!!!! Anybody have a clue where I can get my hands on one of them? Doesn’t what kind of music is on there, any would do! Let me know! 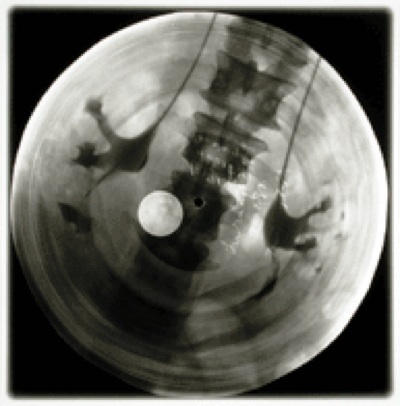 FYI “Sputnik”: the band “Faust” was not a Soviet band, they were West German (mostly), and although their first LP used an x-ray as the cover art, it was not in fact made from x-ray film. thanks, i’ve LONG wanted to see pictures of these, too, since i read about them probably 20 years ago. fantastic! As a teenager in the late 50’s I was witnessing those times in Riga, Latvia! As much as I recollect now – the “Bones” heroes at those times were Little Richard, Bill Haley & His Comets (most often), Wanda Jackson, later Chubby Checker and sometimes even more rare and obscure and unknown to the wide audiences artists like Freddie Cannon (my first rock’n’roll bone record ever was “Chattanooga Shoe Shine Boy”! ), Big Joe Turner, Carl Perkins, Johnny & The Hurricanes and even Tommy Steele. The black market guys were hungry to copy everything they could get, so it’s hard to speak about the musical style purity in this case! What *were* they though? 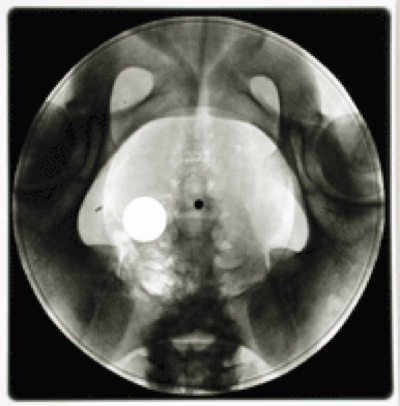 What bands were popular in X-ray format? I’d love to know what acts were getting big play in the USSR black market at that time. I found this really interesting and, judging by the amount of web coverage, it doesn’t appear to be widely reported. 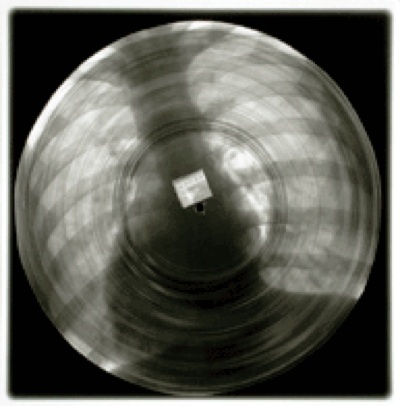 Does anyone know the exact process that was used to copy the records onto x-ray film? Any one who wants a x ray record can have one with any recording they like if they supply me with a cutting stylus, the wav file and some x rays. I will cut the record for free. I have been cutting records for 8 years on different mediums like cds, place mats, acrylic. It often damages the needle and the sound quality cannot be guaranteed. let me know if you are interested. Jazz survived in the Soviet Union in some astonishing circumstances. As jazz historian S. Frederick Starr has recounted, many of the country’s best musicians were actually in Siberian prison camps, but these camps were in many cases ruled by commanders who liked jazz and who organized the musicians to play for their often-lavish parties. Prison camp commanders would even exchange these jazz groups, allowing them to “tour,” as it were, camps where countless prisoners were being worked, starved, and frozen to death. Other bands were exiled to remote cities, such as Kazan in the Tartar region, where they were supposed to undergo “rehabilitation.” Instead, these groups, many of which had learned jazz in pre-Mao Shanghai, took advantage of the local officials’ musical ignorance, and played jazz anyway. In Kazan, the courageous bands even performed on Tartar State Radio. That’s how the early stilyagi kept up with the music: by monitoring Tartar broadcasts to hear exiled musicians outsmarting their cultural keepers. Thanks for the great stuff, readers. Doug and Dylan, sounds like you two should get together. Since I run a site for great documentary films, please notify me when your films are ready for an audience. Maksim, that’s fantastic reporting. The deliberate disruption of the bone records is very similar to the attempts by the RIAA to flood the file sharing venues with junky and broken music files in order to discourage free swapping. If anyone knows where I can get one of these please forward the link. A friend of my is a big record collector and this would be a crazy birthday present. I find this information infinitely interesting, well, in my case distracting since i should be working on college essays. It feels so good, as a musician, to know that through perseverance and creativity freedom can reign, and that music can be and is such a huge influence on that. as an advocate for bittorrent, and freedom of knowledge and experience, i am inspired. bittorent is simply a convenient mode of experiencing as much as i can, artistically and musically, before i die. besides, i still have no choice but to buy vinyl and very indie cds. These were more than likely “direct cuts” on a disc recording system, as described in another comment. But to cut 3,000,000 records one-by-one would take a lifetime. If mass produced, these might actually be “flexi-discs” like those you used to get for free in music magazines up until the ’80s. Flexi-discs were manufactured by using a regular record tamper in a hydraulic press. The material is heated witha heating element to soften it and then it is cold pressed, impregnating the grooves in the material – in this case, X-ays. If these are flexi discs they will have sinlge or double ring measuing an inch or more in diameter around the centre hole, just like a vinyl record. Can anyone confirm if this ring exists on the X-Ray records? how do i find one of these? love it! Anybody know the low-down technical details of how they managed to cut the records? I saw one place about sewing needles and a discarded speaker.